Recent studies have shown that more than 85% of the population is not getting sufficient calcium from their diets. Calcium is an essential mineral for building strong bones and teeth as well as preventing a number of diseases related to this deficiency such as osteoporosis. In order to make sure you are consuming enough calcium, follow our tips below on how to increase your calcium intake through diet. Include a glass of skimmed milk to your daily diet. For people that do not like milk, try to distinguish the taste within a milkshake, a juice, a hot chocolate or a smoothie. In general, three glasses of skimmed milk can give you the adequate amount of calcium you need to cover your daily needs. Opt for foods fortified with calcium such as soy milk or fruit juices that come with extra calcium. You can find this information on the nutrition labels of each product. You can also find water fortified with calcium and many other products in the market that are packed with this nutrient. Try to add foods that are naturally rich in calcium into your cooking. For example, you can add a handful of sesame seeds or you can use a variety of leafy green vegetables with your main dishes, or you can consume specific kinds of fish such as halibut or mackerel once per week. Most types of cereals are a great source of calcium, thus you can consume them for breakfast instead of bread or different kinds of pastries. With an additional small handful of nuts such as almonds, hazelnuts or Brazil nuts you can boost further your daily calcium intake. Having a toast with cheese on the top as a snack is another way to increase calcium intake easily. Also, using yeast extract can also provide your body with more calcium. The most cheeses in the market are rich in calcium, however, due to their high fat contain, make sure that you are consuming cheese in moderation. 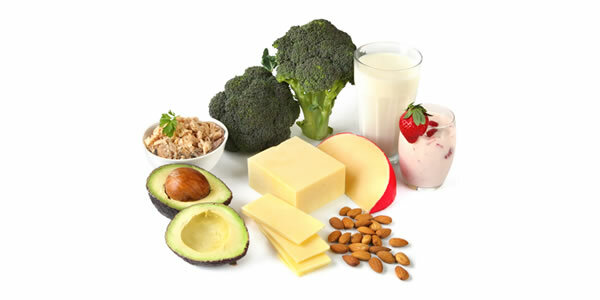 Since some calcium types cannot be absorbed as easy as others, for some foods which contain calcium, you may need more of that food type in order to get the same quantity of calcium. For example, all dairy products are easily absorbed, whilst vegetables and seeds are not absorbed so easy. For that reason, make sure you are keeping your intake of the latter ones high. If you don’t like or you have an allergy to dairy, try to get your calcium from a variety of natural sources and ask your practitioner for a good calcium supplement. Since Vitamin D has been shown to help calcium absorption, it is crucial to make sure that you are also consuming sufficient intakes of Vitamin D.
Foods rich in Vitamin D are: fatty fishes such as salmon and mackerel. Rich in Vitamin D is also the cod liver oil. Finally, you can find high levels of Vitamin D in fortified dairy and cereals. Also, do not forget that a 15-minute exposure to the sun per day will also trigger adequate vitamin D in your skin! Last but not least, in order to boost your calcium intake at its maximum, you will have to cut down on cigarettes, caffeine and alcohol! These substances actually alienate calcium from your body or make it difficult to be absorbed. For these reasons, it is better to cut down on these substances; or at least, increase your calcium intake at max in order to help fight the negative effects. It is worth to note that most nutritionists advise people to consume no more than three cups of coffee or caffeinated drinks per day as well as up to two glasses of alcohol per day. In general, try to include as much plant protein in your daily meals as you can; such as soymilk, nuts, and different kind of vegetables such as legumes. These foods can help your body preserve the calcium in your body. Additionally, try to include in most of your meals wholegrain pastas, rice, cereals, and fruits. Regarding your bone health, as already mentioned above, there are many nutrients that have the potential to affect your bone and teeth health (in addition to calcium), and these are: Vitamin K, magnesium, potassium as well as vitamin D.
At last, don’t forget to exercise! Weight bearing exercise such as running, dancing or even walking slowly can also boost your bone potency and health and help you control osteoporosis.